Thomas Atkinson never ceases to surprise, and his architectural work still keeps revealing itself, with the latest revelations concerning his business partner in Manchester, writes Sally Hayles. We know that Thomas had two professional partnerships. Both were formed for specific projects which no doubt Thomas hoped would enhance his reputation and his pocket. The first began in the late 1820s when he teamed up with Charles Atkinson (not a relation) for the publication of his folio book, Gothic Ornaments Selected from the Different Cathedrals and Churches of England. The second was formed in the mid-1830s in Manchester, with architect and painter Alfred Bower Clayton for a development known as Brighton Grove Villas in Rusholme, Manchester. At the time of the idea for the Brighton Grove project, Clayton was a moderately successful architect mainly working in London and Kent. He had been born in about 1796 in London, the fourth of six children. His father, Robert James Clayton was the Chief Clerk at the Surveyor’s Office of the Navy Board at Somerset House. His grandfather, James Clayton, an attorney and landowner in Chichester, had married Hannah Penn later in life. Hannah was the daughter of Richard Penn, one of the three sons of the proprietor of Pennsylvania, William Penn. We know that in the mid-1820s, together with David Riddall Roper, Clayton had designed St. Mark’s Church in Kennington, south London, a Commissioners’ Church. In 1826 he had also worked with Roper on the Shot Mills, part of the Lambeth Lead Works in Belvedere Road near Waterloo Bridge. Their Shot Tower was a London landmark until its demolition in 1967 to make way for the South Bank Centre. 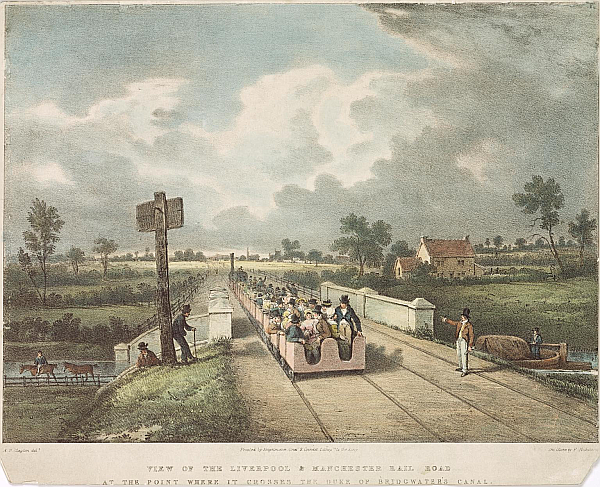 Alfred also had an interest in the railways and the Science Museum holds three of his works: View on the London and Manchester Rail Road Under the Moorish arch (1830), a lithograph showing the London and Manchester Railway at the point it crosses the Bridgewater Canal (1831) and a coloured aquatint titled Geometrical Elevation of the London and Greenwich Railway (1834). They show an early interest in railways and in the north west when he was based in London. In June 1834 Clayton married his second wife Elizabeth and was living at Doctors’ Commons and St. Benet’s Hill in the City of London. A son, Cornelius, was born in 1835, to add to the three children born to his first wife Sarah. At that time, he had purchased the freedom of the City of London in the Guild of Fan Makers (motto: Arts and Trades United). Presumably Alfred must have thought this would enhance his business opportunities. In July 1834, together with Dr David King MD, he had also published Subterranean Passages at Eltham Palace, Lately Discovered and Explored, about their investigation of the ruins of the once-Royal palace in south-east London. Clayton had also been engaged in the development of the New Corn Exchange, Mark Lane in the City of London with the architect George Smith and had designed Christ Church at Herne Bay in Kent between 1834-1835. This may have been a joint project with Thomas Atkinson, although there is no documentation to support this contention. During these busy years Clayton had been exhibiting at the Royal Academy, mainly historical subjects and architectural views. He exhibited 18 times between 1814 and 1837. In 1815, aged about 19, he had won the ISIS silver medal at the Society for the Encouragement of Arts, Manufacture and Commerce (now the RSA) for his ‘Architectural Design for a Monumental Chapel’. His winning entry was in the ‘Polite Arts Section’ for young people. Thomas Atkinson had also won an ISIS medal in 1827 for his drawing of architectural ornaments. Correspondence dated August 1836 gives Clayton’s whereabouts as Manchester and his London address as Doctors’ Commons. The correspondence relates to his submission of drawings to an exhibition at the recently opened Royal Manchester Institution (now the Manchester Art Gallery). He included in his list of submissions a farmhouse lately erected in Harold, Bedfordshire for W. Gambier, a cottage to be erected at Herne for the Rev. GW Evans and a design for the Penzance Court House buildings. His presence in Manchester in August no doubt relates to the June issue of the prospectus for Brighton Grove Villas, Rusholme, his project with Thomas. The idea behind the project was to capitalize on the trend for wealthy Manchester industrialists to move out of the city to grander dwellings in nearby rural areas. In 1831 the number of ratepayers in Rusholme was 3,679. It was soon to transform from village to suburb. Thomas was well qualified architecturally for the project and his stock was high in Manchester. He had built a number of grand country houses for prominent men and completed the very grand St. Luke’s Church at Cheetham. He was also engaged in building the Manchester and Liverpool District Bank headquarters in the centre of the city. The Brighton Grove project came hot on the heels of a similar development at Victoria Park which had been launched in April 1836. That project had as its architect Richard Lane, well regarded in Manchester and likely a rival to Thomas. Both projects were to be financed by subscription. The newspaper entries in June 1836 for the Brighton Grove project show a prospectus asking for 800 shares at £50 each, raising £40,000 capital. In contrast, the Victoria Park scheme offered 7,500 shares at £100 each. Thomas and Alfred’s plan for the development was extremely attractive, aided by Thomas’ skill as a landscape architect. It included houses built around a lake with rustic bridges, pleasure grounds, and good access to the city. In this it was remarkably similar to the Beulah Spa project in south London, which also sought to sell of attractive plots of land and houses to the gentry via an early form of mortgage. Ultimately, the Brighton Grove scheme failed to win backers, perhaps because Thomas and Alfred were financially unrealistic. In October 1836, less than six months after the launch, their partnership was dissolved. Nothing in Clayton’s biography suggests that he was a risk taker and perhaps he quickly got cold feet, leaving Thomas to face the failure of the project with only a handful of villas and the gatehouse completed. In 1838 Thomas was made bankrupt over another project. Perhaps it was just that Clayton’s life took a different turn. He seems to have abandoned London for the north. A further child Mary was born in Ormskirk, Lancashire in 1837, followed by Robert James in 1839 and Octavius Plater (another tribute to a friend, see below) in 1841 when the family were living in Aughton, a small village near Ormskirk. His next child Decima was born in 1843 and the family were living at Queen Anne Street, Liverpool whilst Alfred was running an architectural practice at 3 Cable Street Chambers, Liverpool. The only work during this period attributed to Alfred was the remodelling of Norley Hall, Cheshire in 1845 for wine importer Samuel Woodhouse. By 1851 the family were living in Everton, north Liverpool. The Royal Collection Trust has two lithographs dated 1855 that are said to be after Alfred and which show the costumes of the 1st Grenadier Guards. He was the bridgemaster, responsible for the upkeep of bridges and highways in the area, for the Hundred of West Derby, one of the six subdivisions of Lancashire. His offer to superintend all the county buildings without extra pay was accepted by the county authorities. Alfred Clayton died in 1855, although his widow Elizabeth survived until 1881, having moved to Balmain in New South Wales, Australia to live with Penelope, Alfred’s sister. Thomas died in Walmer, Kent in August 1861. It is unclear why he chose to go to Walmer but there are possible connections with Alfred, who knew Walmer, having exhibited a drawing entitled A Norman Arch in Walmer Church at the Royal Academy in 1827. Perhaps the friendship with Thomas had endured? Quite what Clayton would have made of his grandson Edwy Godwin Clayton one can only wonder. Born in 1848 to his eldest child Alfred (also an architect), Edwy was an analytical chemist – and the explosives expert for the Suffragette Movement. He had married Clara Tilbury in 1881 and both were strong supporters of the movement. Edwy was identified following a raid on the flat of Annie Kenney, a leading Suffragette. The police found letters from Edwy to Kenney about mixing chemicals and suggestions as to possible targets. He was sentenced to 21 months. Edwy did not forget his grandfather and in the 1920s wrote to various architectural journals asking for information for a monograph he was preparing about Alfred. If only we could find that monograph we might be able to answer some of many questions that still remain about the extraordinary life of Thomas W. Atkinson.